Are you a small business owner who doesn’t enjoy writing? Perhaps you’re just tired of writing and you want something different? Or maybe your audience doesn’t like to read as much as they like other forms of content. If that’s the case, I’ve got some great tips for non-text content and information that will capture your audience’s attention. Videos are huge right now and people love them! Not only that, but 50% of people fail to read past the first 100 words on a website, but 95% of viewers will watch about a minute of a video. Keep it short and you’ll grab your audience’s attention! Videos are all over social media, like Facebook and Instagram. If you want to be found more easily, always make sure you post your videos on YouTube which is a Google-owned search engine. Your website is a critical place for your videos. You can post a video on your homepage and in your blog articles. And use plenty of video testimonials because they convert like crazy! For either your website or your social media profile, consider using product demo videos. These can either be live or animated. Make it fun and interesting and you’ll keep your audience wondering what will happen next! So videos are great. They capture people’s attention right away because people love to watch things that move. It’s just the way our brains are designed. In addition to video, audio files – short teaching episodes, podcast interviews, and snippets of coaching calls, or even snippets from an event – are also valuable for your audience. At an event, record conversations with the people you talk to while you’re there; or maybe even invite the presenter to speak with you! Make sure you provide real value in your audio content piece, as with all your content pieces. Offer your audience a variety of ways to engage with your content. For instance, people love polls. They get lots of shares, at least in part because people like to compare their answers to how other people respond. Another type of non-text content is surveys. Use surveys both to get people to engage, and to collect information for your company. Sometimes people want to respond anonymously, and sometimes they are willing to include their contact information and detailed answers to your questions. Once your prospect takes the time to take your survey, they are much more likely to engage with you in other ways! In addition, surveys are great because you can frame the questions in such a way that you encourage people to think a little bit about how and why they may need help with a particular topic. You may also consider creating an assessment for prospects to take (similar to a survey, but it is mostly intended to provide the prospect with revealing information about themselves). The idea is to include questions in the assessment that lead the prospect to recognize where they are falling short. And of course, the questions are usually related directly to something you can provide for them as a service that will help fill a hole they haven’t even recognized yet. Assessments are valuable and people love to take them. A less interactive, but still valuable, type of content, are images. One type of image is an infographic. People love infographics, again, because our brains love visuals. They are easy to digest and people love to share them. If you want to include infographics in your content marketing plan, you can either hire someone to do it for you (such as on Fiverr), or you can try one of the online software program. Some, like Canva, are free, or you could purchase one of the many relatively low-cost programs available. They are usually a simple drag-and-drop interface. Charts and graphs or snapshots of data make things really clear to understand. Finally, bring your audience on a journey from point A to point B. Timelines are a great visual tool you can use that’s not written content. I hope this has been really valuable for you. Think about what other types of content you can use to engage your audience, content that will help build connections and relationships; content that builds strong brand awareness. Let me entertain you! 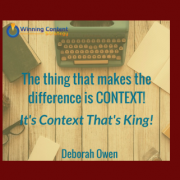 Your guide to entertaining content Content is NOT king!